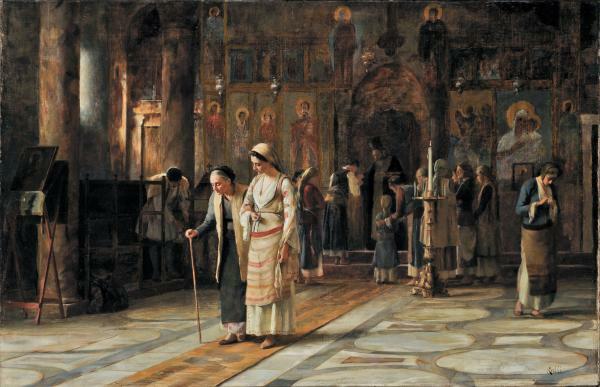 The work in the A. G. Leventis Foundation Collection, which went on display in 1895 at the official annual Paris Salon, depicts an interior setting in an Orthodox Christian church while the priest is administering the consecrated bread to the faithful in front of the iconostasis. Of the two main female figures in the foreground, the younger one, a lithe girl in traditional Greek costume, is supporting the elderly one, who walks with the help of her stick. The light, coming from the left, accentuates the fine colour palette that the artist has used for their garments. The background, on the contrary, is darker, establishing an evocative ambiance that resonates with the sanctity of the setting. Architectural elements, icons, frescoes and ritual objects are all rendered meticulously, the realistic description seeking to achieve an effect of verisimilitude. Coming from a family originally from Chios, he abandoned his career as a businessman, which his family intended for him, and moved toParis, where he studied painting under Jean-Léon Gérôme until around 1880. He exhibited at the Paris Salon (1875-1909), was a memberof the Société des Artistes Français, (1878, 1889 – silver medal, 1900) and participated in a large number of exhibitions in France and othercountries. In 1885, the year when he won an honourable mention at the Salon and received the Cross of the Saviour in Greece, he obtainedFrench citizenship. He also earned a silver medal at Olympia in 1888 and in the Athens World Fair in 1903. In addition to Paris, until 1904 hemaintained a studio in Cairo, where he became very active in the organisation of annual exhibitions. In 1900 he received the French medalof the Knight of the Legion of Honour. In 1910 the National Gallery in Athens accepted the Rallis Bequest; a year later, the Theodoros RallisAward was given for the first time in Paris; in 1912 the first Rallis Art Competition took place in Greece. He mainly produced genre works featuring Greece and the East, where he often travelled. He is regarded as the main exponent of Orientalismin Greek painting in the latter half of the 19th century.